A. Cafetalk is an innovative service that provides one-to-one language lessons via Skype. A. Yes! Get your free membership here. Q. What do I need to start? A. You need a computer or mobile device (smartphone, tablet, etc.) that can connect to the internet and download/use Skype. A. Skype is a free voice and video calling application. Once you install Skype, you can take lessons from tutors all over the world. Q. Which browsers are recommended? A. Yes! It’s free to join! Q. Are there any monthly or annual fees? A. No, we never charge monthly or annual fees. We use a pay-as-you-go system and you only have to purchase as many points as you think you will need (minimum purchase is 500 points). Q. How many lessons can I take per month? A. There is no cap. Once you purchase points, you can take as many lessons as you want within the validity period (5 months from the date of your purchase). Q. How do points work? How much is 1 point worth? Q. How do I pay for a lesson? A. You can pay for points by bank deposit（Japanese Banks only), credit card (Visa, Master), or Paypal. Q. How much is the minimum purchase? A. The minimum purchase is 500 points (540 yen including tax). Q. I’ve used up all my points. Can I take a break and then come back and take lessons again? A. Yes, Cafetalk has no monthly fee, so you can proceed at your own pace. If you decide to come back, just buy some points and you can start again. Q. Are there any trial lessons? A. Many tutors offer free or discounted trial lessons. The trial fee and lesson length differs by tutor. Trial lessons are indicated in green. A. The shortest lessons are 15 and 25 minutes long. Lessons longer than 30 minutes are also available, increasing in 10 minute increments for up to 120 minutes. Q. When can I take lessons? A. You can take lessons 24 hours a day from the tutors all over the world. Q. Please help me find the right lesson! A. Please request a free counseling session. Cafetalk counselors will recommend the best tutors and lessons for you. Q. Do I need a textbook? A. It depends. Tutors decide whether they want to use specific textbooks or their own, original class material. If you prefer textbook oriented lessons or have a particular textbook you’d like to use, please feel free to contact our Support Desk. Q. What is a lesson request? A. Lesson requests are what you use to book a lesson. They include booking information such as date, time, coupon or trial usage, and any comments or requests for the tutor. Q. I can’t contact my tutor! A. Please contact the Support Desk. We’re open 24hrs a day from Mon to Fri (10am-7pm on Sat, Sun, & Holiday). You can contact us through Skype, telephone, or e-mail. Q. Tell me more about Cafetalk Tutors. A. Cafetalk has gathered a diverse group of people, including businessmen, professional basketball players, lawyers, and conversationalists. They live all over the world and have all sorts of skills, helping us offer you a great variety of tutors. Q. What does the banner on the tutor’s profile picture mean? A. There are 5 types of banners that may show up on a profile picture: 『PREMIUM』『POPULAR』『HOT』『RECOMMENDED』and『NEW』. The banners are there help you choose which tutors you would like to go with. ★ PREMIUM： Completed numerous lessons in the past and has a great reputation. ★ POPULAR： Earned awesome feedback and is well liked by students. ★ HOT： Receiving an increased number of lesson requests. ★ RECOMMENDED： Recommended by Cafetalk staff. 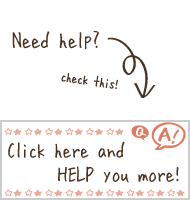 ★ NEW： New tutors will have this banner for 3 months. Q. Can I change tutors? A. Yes, you can change tutors at any time. Usually, Cafetalk students list a few of their favorite tutors and go to them based on their current study needs. Q. How do I select a suitable tutor? A. Please ask us for a free counseling session. Cafetalk counselors will recommend you the best tutors and lessons for your needs. A. Please check out the Featured Interviews and Movie Interviews with our tutors to find out more about them! Q. What are coupons? How can I use them? A. Coupons are discount tickets that the tutors issue. You can use coupons to receive discounts on regular priced lessons. Please feel free to use them for their designated lessons and time periods.